The new season is almost upon us so I will start a new section. Number ten is getting a little too big. Allow the attackers to cross the far blue line before leaving so that there is a 2 on 2 attack first before it becomes a 4 on 4. I like the D on one side and F on the other to make it easier to talk with them. Leaving from each side also works. 1. Start with a 2 on 2 attack. BF1 and BF2 vs RD1 and RD2. 2. RF1 and RF2 and BD1 and BD2 support the play from the lineup. 3. Play 4-4 in the zone. 4. On transition or after a goal or frozen puck RF1 and RF2 attack BD1 and BD2. This game focuses on Role 2 - getting open and Role 4 - covering away from the puck. The joker shoulld focus on facing the play and seeing the ice. Other players continuously battle for the inside position. Attackers give a target and defenders good sticks. 1. Play inside top of the circles in one or both ends of the ice with both teams shooting on the same net. 2. To transition to offense you must pass to the joker. 3. Joker passes back to the team that he got a pass from. 4. Joker can move anywhere below the dots. 5. Players change on their own. 6. Coach put in a new puck on a goal or if the puck is shot out of the zone. 7. Keep score-have tournaments, modify rules to focus on skills or good habits. 8. The joker can wear a different colour or rotate jokers. This drill works on the wide hinge, giving targets, pass to the middle, wide entry and middle drive. Everything should be done as quickly as possible with good habits like stopping at the net for rebounds. 1. Start with the players in the middle circle with red on one going one way and blue the other. 2. Two D from each team start at the blue line. 3. F1 pass to D1 who skates to the middle and passes to D2 who has hinged wide and up. 4. D2 pass to F1 in the middle. D return to the middle circle. 5. F1 pass to F2 who enters the zone in the wide lane. 6. F2 shoot and both forwards look for a rebound. 7. This drill is done from each end. *The coach could add tasks like Red F1 defend a 2-1 vs. the Blue F1 and F2 coming the other lane or skills like F2 shoot low to the far pad while F1 goes for the rebound. Continue this flow. The coach doesn’t always blow the whistle so the defenders must be alert. Role One - the player with the puck must protect it and skate to open ice. Role Two - player without the puck must get open and give a target. Role Three - player checking the puck carrier must have the stick on the puck and in the passing lane. Role Four - player away from the puck must see the puck and the player they are covering. Stick in the passing lane and body on the defensive side. 1. Players line up on both blue lines. Two players from each team play keepaway in the neutral zone. They pass to each other or to the same colour on the blue line. 2. Keep score with a point for making 5 or 7 consecutive passes. 3. Rotate in from one end of the line every 30 seconds. 4. Variation is to focus on skills such as: only forehand passes, backhand, skating backwards, one on foot, sticks the wrong way, one hand only on the stick, pivot before passing, skates on the ice and skull, etc. Balance position with as much blade on the ice as possible. Turn and pivot with balance. In forward skating turn with upper body facing the turn direction. Use a chocktow turn front to back. 1. Skate forward with crossovers around the top of the circle and the bottom of next circle. 2. Point the stick at the dot on the ice with one hand on backhand and two on forehand. 3. Start forward pivot backward and one foot skate to far end. 4. Start backward pivot forward one foot airplane to far end. 5. Start forward pivot backward and one foot forward airplane to far end. I highly recommend that coaches watch the 26 minute video of Gaston explaining the forward and backward stride along with turning, starting, stopping. I just watched it again myself and learn a lot of things every time. The mechanics of skating are poorly understtood. Gaston demonstrates and explains on ice. Gaston explains about creating tension on the ice with the skate stride. Skate around the five circles and change direction each circle. Upper body rotate in when skating forward. 1. Start in the corner and skate around all five circles. 2. Forward, backward and alternating directions are possible. 3. Send between 3-5 players at a time. 4. Add carrying a puck. Skate with long strides to warm-up before practice and conditioning at the end. Skate forward and backward. To warm-up the goalie the coach shoots at the four corners and five hole. 1. Skate in four five man units so it is a 1 effort to 3 rest ratio. 2. Warm-up skating with long strides from the red line, behind the net to the red line. 3. End practice with everyone skating around the coaches in four groups. 4. Skate forward from the corner around the coach and then pivot to backward skating around the other coach and back to forward two laps. 5. Coaches move every rep so the ice doesn’t get broken and ruined for the next practice. 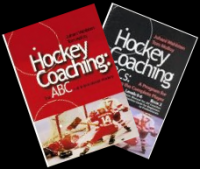 I started posting coaching material when Dennis Freed had the hockeycoach.com site. Mike Hartman took over the site and used the same name and recently it has changed names to hartman100 and is a life coaching site. He still has a section where I post hockey material. I like the format because it is easy to see everything in groups of ten. When I post material in the drills sections I then copy and paste them to the drills section. http://hockeycoach.com/ and then go the the hockey drills forum. There are 250 drills and games posted so far. You may have to click on discussions to get to them. Click on 'view all' and they are all listed in groups of ten. It is the same material as in this ABC site but in a different easy to view format. While the National Teams are practicin there are also elite figure skaters at the COP complex with it's four rinks. These figure skaters are doing a lot of the same balance and edges exercises as the hockey players. Notice how efficient their movement is. I took some video and then gave my camera to someone else and I am the guy in the grey outfit that comes on the last 30 seconds. Skate forward and backward pivoting each way. Skate on all of the edges with good posture. These are 8 skill practices that I did with my hockey class. The pdf has diagrams. It is an example of ABC model practicing. The group was 11-14 years with 24 skaters, two goalies. idea of the skill levels. carry the puck all around the body. B2 Shooting – blueline to ringuette line back to blueline and shoot. D4 – Round Robin Tournament 3 x 5 min. games of 2 pass at each end. Game one - everyone must face the puck. Game two – must make 2 passes. Game three – everyone must touch the puck. D100 full ice 3-3, rule one pass in each zone max. 40” shifts and pass to the goalie on the whistle. D4 half ice game of 2 pass. A3 – Russian warm up around the rink and shoot at each end. B5 – 2-0 cross and drop then one pass and shoot and go for the rebound. Progress to a 1-1 and then a 2-1. B3 partner passing. Instruction. Standing then moving, then with variations in passes and movement. and be onside. Wrist passes only. D1- everyone play full ice with the there must be at least one pass in each zone. B500 puck handling in the neutral zone. Review all the Russian moves. D4 games Where they must clear the zone and all get onside. 5 min with they can only skate backward. 5 min. with the rule they must hold the stick the opposite way. B6 shooting and puck handling. 3 lanes..
pass the puck back to the goalie. Rule: at least one pass in each zone. 8 min. Rebound at each end. C2 Kozak angling drill 1 on 1. D400 transition game on 1 on 1 with a sequence of support, breakout, attack, defend, rest. D1 game. Everyone plays and there must be at least one pass in each zone. 5 shots they skate to the bench for the next shooter. Rule is a max of 3 shots then return the puck and go to the bench. Rule: players must do a tight turn when they get the puck. the forehand. 3. Transition skate. C3 1 on 1 from both sides. E1 2 shot shootout. Score 2 goals zero laps, one goal one lap, zero goals 2 laps. D4 Two games of 2 pass with one at each end. B6 Full ice figure 8 puckhandling with shots. D100 Transition game of continuous 1-1, then 2-1. D200 with jokers below the goal line from 1-1 to 4-4. You must pass to a joker before scoring. D1 Shinny with everyone playing. Max 2” with the puck. If more than that the coach blows the whistle and other team gets the puck. On a goal the scoring team must touch the red line before checking. E1 Shootout - Players line up in the middle and shoot at each end. The first team to 10 goals wins. A 3 Warm up with the puck. Carry 2 pucks, one puck with various big moves, toe drag around each dot and shoot at each end. B1 Shooting. 3 pucks each and go continuously with half the players on each blueline. Skate up to the top of the circle, back to blue, forward and shoot x 3. Next player leave when you are going backward. C3 Passing and Shooting: skate along the red line with a give and go to the first player on the other side then go in and shoot. Circle back for the rebound of the next shooter. Alternate ends. D4 Play a game of 2 pass at each end. Stress facing the puck and sticks on the ice. D400 Perry Pearn 2 on 2. Defending team must get over the blueline before passing to the teammates at the red line. D400 Cross ice game with 2 jokers behind the defensive net. U must regroup with the jokers on transition. D400 cross ice shootout with one player from each team leaving at the same time and shoot at each goal. Count the goals for each team in 5 min. D1 Warm up game uing 1 racquet ball, 1 tennis ball, 1 ring, 1 hockey ball. Leave the ball or ring in the net after you score. Only on thing can be shot on net at one time, the goalie must be ready. B2 Shots. Each player has 4 pucks and go end to end 4 times. Skate up to the top of the circle, back to the blue line, up and shoot. Next player leave when you skate backward. Continue 4 reps each. B1 Instruction on one timer shots and then players practice with partners shooting at the boards and the net. B500 One Timers: Skate and open up with the stick back and get a pass and shoot. The passer now leaves and shoots from the forehand side. B5 Players skate around the circle cross and drop then make a pass for a one timer after they cross the blue line. D400 Play a 2-2 transition game. Goals only count on one timer shots. Transition is passing to teammates waiting at the blueline. The original attackers must play defense when the new attack starts. E1 2-0 Shootout: Use one timers between the top of the circle and hash marks. Gaston worked with some of the players at the Jasper camp who wanted more advanced training early in the morning. The Chocktow turn is a much more efficient front to back pivot than what is usually taught. The player uses his speed and doesn't scrap against the ice at all, which is inefficient. Great players like Niedermeyer who took figure skating as a kid use this turn. I pasted an extra link to clarify the technique with Gaston demonstrating. Right now he is in Scuol, Switzerland doing a camp from Aug. 11-18. I was supposed to do the hockey part but they decided to use a Candian coach who lives nearby and save the money they would have spent on my travel and accomodation. I was looking forward to it. The place looks beautiful in the internet pictures. Quiet village in the Swiss Alps. http://www.myswitzerland.com/en/scuol.html is a link to a short video of the winter and the summer in Scuol. Skate front to back on an arc using the Chocktow pivot and then do a tight turn each way before going to the next dot. 1. Leave skating forward from behind the goal line. 2. Before each dot do this sequence. 3. Chocktow pivot front to back. 4. Open up facing forward and turn. 5. Tight turn one way. 6. Tight turn the other direction. 7. Alternate which side you do the first Chocktow turn. Demonstration of the Chocktow front to back pivot. Give and go with the stick as a target and ready to shoot. Turn the body into the shot as much as possible. The goalie must track the puck. Drill is good for goalie movement and scoring practice. 1. Start from the top of the circle in two lines. 2. Pass across and skate to the net for a return pass. 3. Shoot a one timer and stop for the rebound. 4. Pass from the other side - repeat. 5. Goalie track the puck across. Goalies now go to their own camps and practice the movement and techniques. Here is a clip from a camp in Calgary. There were 3 groups of 30 goalies each. There are more youth hockey goalies at this camp than there are in many of the hockey playing nations. In the 80's coaching changed a lot. All of a sudden instead of the coach simply telling the players the next activity; especially one that they already know, the coaches started always going to the whiteboard and diagraming everything. Assistant coaches quietly move around and like the housekeeper move the pucks from one area to the other. Problem is that now the assistant coaches don't hear the key points of the drill and appear to be subserviant to the players. It is demeaning. It is my pet peeve (I did this for 8 years at university). When I teach PE I don't need to draw everything out. Simply tell them or get a few of the more skilled players to demonstrate. Also expect them to remember drills and games you have done before. Give the drill or game a name and then add passes or shots etc. We are losing players because practice isn't fun (second largest answer given by players who quit - 80% in Canada quit by 14 and then many start playing again in beer leagues as adults where they don't have to listen to someone babble their ice time away). The video is of the womens team of Kazakstan. The players simply move the pucks then get instructions from the coach. Easy and RESPECTFUL. Players can easily move pucks to where they are needed for the next exercise. 1 - Assistant coaches can see and hear the details of the next drill or game. 2 - Demeans the value of the assistant coaches when they appear to be servants instead of mentors to the players. 3 - Quick and efficient. 4 - Reponsibility: You use it - You move it. *At the end of practice every player can pick up 2 or 3 pucks and put ithem in the bag. It is done in less than a minute. This is a video clip of various training methods used with goalies in Kazakstan. They are a part of the former Soviet Union and there is a big Russian influence in the coaching. Players move from station to station and do skating, shooting and puck protection skills. 1. Puck protection then walk-in, pass and shoot. Passive resistance. 2. Bungie cord skate and shoot. 3. Skip on one leg and alternate legs. 4. Pull partner across the ice on one leg. 5. Move balls to opposite pylons. Focus on good technique with the weight over the middle of the blade and using as much blade on the ice as possible. Use the Chocktow Turn in the front to back pivots and cut small S’s while on one foot. The players rotated through these stations. 1. One leg skating while being pulled to the side with a rope. 2. Pull a partner who holds onto a strap and gives resistance. 3. Triangle agility skate with stop and turn. Forwards face the puck at all times and be ready for a pass. Defense skate back and forth and keep a close gap on the forwards before they attack. 1. There are two nets on the goal line. 2. Three forwards pass the puck in the neutral zone while two defense skate forward and back from the blue line to the top of the circle maintaining speed and gap control. 3. On the whistle the forwards attack vs. the two defenders. 4. Forwards can score on either net. This game can be done at either one or both ends. Defender should close the gap using lateral and back skating keeping the stick on the puck and defensive side. Attacker use moves and fakes but skate at full speed and protect the puck always when within a stick length of the defender. 1. Defense line up inside the middle circle in C1 formation. 2. Forwards line up at the four blue lines on the boards in B600 formation. White forwards get a pass from the white D and attack vs. the blue D.
3. Start with D1 at each end one touch passing back and forth with D2 at the front of each line. 4. F1 skate into the neutral zone and post up for a regroup pass from their D1 on each side. 5. After passing each D1 defends on the other side vs. the opposite team F1. 6. Finish the play with D1 maintaining D side and taking F1’s stick and F1 fighting for a rebound. *A good habit to install is have D1 pass to a forward at the back of the line on either side, or a coach if he regains the puck. This gets them used to finishing the play. Chaos develops split vision and the drill demands that the players pass while skating. Always face the puck and give a target with the stick on the ice. 1. Half the players line up along the blue lines while the others skate with a puck in the neutral zone and pass to the players on the blue line. 2. Move all around and not just in a circle. 3. Alternate passing to players on one side and then the other blue line. Tasks like skating moves or types of passes can be added as well as bursts of speed or passing to one line and then the other or passing to each player. Knocking the puck off other players sticks can also be added to create puck protection skills. Face up ice all of the time. Cross and leave. Hit the net. Quick feet. 1. D are lined up near the blue line with pylons and pucks on each side. 2. R1 skate forward for a puck and then around the pylon. 3. B1 skate around the pylon and behind R1. 4. R1 drop the puck to B1 who Shoots. 5. B1 gets a new puck and skates around the pylon while R1 skate around opposite pylon. 6. B1 drop to R1 who shoots. 7. R2 and B2 repeat on the side with B2 starting. Start with easy soft passes to the wheelhouse and then give hard passes within reach that the player must adjust to. Either the coach or players can do the passing. With the players passing rotate to shooter after passing. 1. Pucks are in the middle near the blue line. 2. Coach or a player pass to a player who takes a one timer. b. Force Production – bottom arm is straight and body rotate to the target. c. Crucial instant (contact) - energy to a few inches, cm. behind the puck. Maintain contact with the ice as long as possible allowing the shaft of the stick to bend then project the puck. d. Front knee and stick blade point to the net. *Players can rotate pass-replace shooter-repeat the other side or else pass about 5 pucks in a row and then rotate. Give support on the wall and in the middle lane. On the wall face the puck and in the middle skate laterally giving the stick and skates as a target and be about a stride behind the movement of the player making the breakout pass. Player on the wall stay there unless the middle player crosses into your lane. 1. Players line up in the middle in the C1 formation with pucks at each end in the far corner. 2. Player two leave from each end and time getting open on the wall for a breakout pass from player one. 3. Player two shoot at the far end. 4. Player one make the breakout pass and then circle back to support the next breakout from the middle. 5. Player two shoot and get a new puck behind the net and make a breakout pass to either player one or player three who has left from the line-up in the middle. 6. The coach or else the player who wasn’t passed to cover one of the forwards breaking out and force the player making the pass to recongnize who is open for the pass. One coach should watch that the players won’t collide. It is important to look behind and for the player with the puck to skate away from oncoming players. This is a great game for 1-1 and conditioning. 1. Players line up along the boards one group on each side of the red stripe. 2. One player of each team leave every 15”. 4. Pass to a teammate when the second whistle blows. 5. Only two pucks on the ice and get the puck out of the net after a goal. 6. After scoring touch the red line before defending. This is a great 18 minute video with Yashin in his prime and then Finnish pro's leading the hockey school kid's in the Russian puck handling routine. Jursinov developed this routine to separate the movement of the upper and lower body, to loosen the shoulders and create big moves. Probably the easiest and best thing you can do to help players improve their puck handling skills. They can do it alone when they are at home or when they step on the ice. Increase the size of the moves by reaching as far as possible with the puck. Separate the movement of the upper and lower body by skating away from the puck. Players must be able to handle the puck under control around and through their body. - Reach each way only with the top hand. - Skate away from the puck. Skate right reach left and skate left and reach right. - Reach as far forward and back as you can using the top hand. -Put the puck from the stick to inside and outside edges back to the stick. -Move puck from behind to front through skate forehand and backhand. -Escape moves backward with the puck and tight turns each way. -Fake a shot and go left then right. Spin on backhand. -Touch each knee while skating. - Yo-yo the puck give it and take it away. - Toe drag fake inside and pull the puck back while sliding back. - Bring the puck from behind to in front through the skates on forehand. - Bring the puck from behind to in front through the skates on backhand. - Skate fake inside and go outside. - Exaggerate reaching back to front on each side. - Turn with the puck. - Quick lateral three strides on way then the other. Video with Vladimir Jursinov teaching a puckhandling sequence to the U17-U20 morning skills group with a few pro players as well. Latest and Greatest Ideas for Effective Puck Protection and Scoring. Battle hard for the puck and go into the corner on an angle. Bump on the way in to get inside body position. Use fakes and cutbacks along the boards and protect the puck. Keep the feet moving. 1. Players line up in the middle near the blue line. 2. Coach dumps the puck in and the first two players race for possession. 3. First player on the puck try to score and second player defend. 4. If defender gets the puck they can score also. 5. Progress to a 2-2 with the second player on each team giving support. Play man on man defense and create 2-1’s on offense. This is a pdf of the Russians Big Moves Puck Handling and Passing Skills Warm-up. It is a routine that the players do all season and all career to practice the skills for handling the puck and skating. I posted the warm-up a few topics above this and these are the exercises plus a few more. The link for Yashin doing the exercises and then Finnish pro's leading a hockey school group during Juuso's hockey school in Mikkelli, Finland is reposted below. Hit the net so the goalie can make the save and then make a breakout pass. Give good targets on the wall and time with the other side so goalies have time to pass between shots. 1. Red 1 and Blue 1 leave toward far end. 2. Goalie at each end pass to 2 on boards. 3. Blue 2 pass to Red 1 and Red 2 pass to Blue 1. 4. Blue and Red 2's skate to the other end for a breakout pass. 5. Blue and Red 1's shoot on net from top of circles. 6, Red 3 pass to Blue 2 and Blue 3 pass to Red 2. 7. Continue rotation and then switch side after a few minutes. All times are GMT. The time is now 12:35PM.